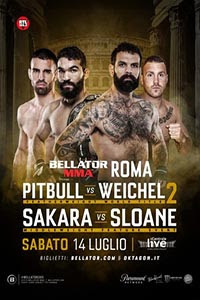 Bellator 203: Pitbull vs. Weichel 2 takes place July 14, 2018 at Foro Italico in Rome, Italy. • Patricio Freire vs. Daniel Weichel (FW Championship): Patricio Freire defeats Daniel Weichel via split decision (49-46, 47-48, 48-47). • Alessio Sakara vs. Jamie Sloane: Alessio Sakara defeats Jamie Sloane via TKO (punches) at 1:19 of Round 1. • Vaso Bakocevic vs. Andrey Koreshkov: Andrey Koreshkov defeats Vaso Bakočević via knockout (spinning back kick) at 1:06 of Round 1. • Will Fleury vs. Alen Amedovski: Alen Amedovski defeats Will Fleury via knockout (punches) at 1:49 of Round 1. • Maxim Radu vs. Simone La Preziosa: Maxim Radu defeats Simone La Preziosa via TKO (punches) at 4:50 of Round 1. • Michele Martignoni vs. Simone D'Anna: Michele Martignoni defeats Simone D'Anna via knockout (head kick) at 0:06 of Round 1.